Quadrasan is a cleaning and dosing system that provides continuous and programmable maintenance ensuring toilet and urinal fixtures remain clean, sanitized and odor free. Click here for more info! The professional's choice for a no-nonsense bowl cleaner. Effective on the toughest of hard water deposits. Pioneer Brite STOP IT is a broad spectrum organic odor neutralizer concentrate. 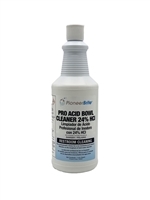 Water soluble and formulated with Oxychlorodene for complete odor neutralization. FRESHEN UP is a concentrated odor neutralizer that is compatible with any cleaner/disinfectant, as well as water based floor strippers, and any carpet care cleaner system.